Robert Branco is an author, editor, publisher and contributor of the many books and publications found on this page. Weighing Things Up, Book Two is Robert T. Branco’s fifth published book. 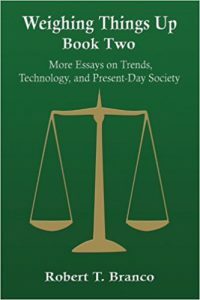 Weighing Things Up, Book One (2014) consisted of 103 short essays on issues pertaining to blindness and the blind, bureaucracy, holidays and our changing attitudes toward them, some absurd pieces of legislation, politics, scams, sports, modern technology, and a wide variety of social issues. Numerous comments and links to articles offering more information were added by the editor, Leonore H. Dvorkin. Weighing Things Up, Book Two consists of more than 100 new essays on many of the same subjects. The majority of these essays were previously published in Matilda Ziegler Magazine for the Blind; on Ernest Dempsey’s blog, Word Matters; or in the author’s own online newsletter, The Consumer Vision Magazine. This is Bob Branco’s 4th published book. 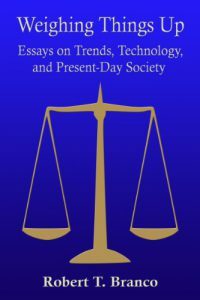 It includes 30 essays on issues pertaining to blindness and the blind, then another 73 short essays having to do with bureaucracy, holidays, legislation, politics, sports, scams, technology, and social issues. Numerous editor’s notes and links to articles add more information and occasionally a different point of view. 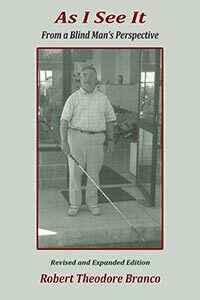 In this book, Robert discusses numerous issues pertaining to blindness, including legislation, discrimination, employment, myths about blindness and adaptive technology. This second edition includes two dozen new essays on website accessibility, relationships, Beep Baseball, personal care issues and much more. Paperback version $12.99 plus shipping. Order directly from Bob Branco call 508.994.4972 or email bobbranco93@gmail.com. 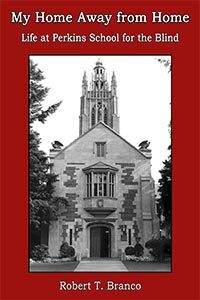 This book tells of Robert’s experiences during his eight years at the Perkins School and will provide you with an understanding of some of what life was like for a young man growing up without total vision in a sighted world. From the ages of 12 to 19, the author attended a school for the blind. He tells about life in the “cottages,” academics, sports, field trips, vocational training, and more. He had good and bad teachers, followed wise rules and absurd ones, met good friends and bullies, and welcomed administrative changes. Perkins educated him very well; this book will surely educate and entertain many others. To order a paperback copy from the author, please make out a check for $12 and send it to him at the above address. Introduction: My Home Away from Home: Life at Perkins School for the Blind is about eight of the most important years of my life. Just like anyone else between the ages of 12 and 19, I had a lot to learn about growing up. However, contrary to what most pre-teens and teens experience, I lived those eight years at Perkins School for the Blind, in Watertown, Massachusetts, 65 miles from my home.In the book, I talk about our academic classes, our teachers and other adults at the school, the many kids who became my friends and others who made friendship impossible, the several sports we pursued, all the rules we were supposed to follow and how radically they were sometimes broken, some of the fascinating field trips we took and new technology that we explored, the ways in which the school tried to prepare us for independent living, and much more. As you will read, there were plenty of both good and bad times. It is also important to note that I was at Perkins during the entire directorship of the only visually impaired chief administrator Perkins ever had, Mr.Ben Smith. My classmates and I watched in almost unanimous approval as he changed many of the school’s long-lasting policies. I decided to write this book because I continuously tell my friends about my adventures during those years, and I used to kid around that I could write a book, because there was so much information for me to share. Finally, I took the plunge and decided to write my experiences down, so I could share them with the world. I hope that my story puts a unique perspective on what it’s like for any teenager, blind or sighted, to live away from home for eight years. I certainly hope that the sighted, as well as the blind, will enjoy and appreciate my story. I would like to thank my editor, Leonore H. Dvorkin, for working closely with me. I am grateful to her for completely understanding both the nature and the aim of this book. See the end of the book for more about the editing and publishing services that she and her husband offer. I would also like to thank Ross Chartoff for his role in helping me to assemble and submit the required components of this book. A cookbook featuring recipes that were all contributed by blind individuals. Available in large-print format and on audio CD A limited number of Braille copies are also available. To order a copy of the cookbook in any format, please order directly from Bob Branco call 508.994.4972 or email bobbranco93@gmail.com. All sales benefit Bob’s publication, The Consumer Vision Magazine: http://www.consumervisionmagazine.com. The Consumer Vision Magazine is a human interest publication for blind and sighted individuals. The Consumer Vision is produced in print, braille, cassette, audio CD, email and online. To subscribe or make a contribution to Consumer Vision Magazine please contact Bob Branco at (508) 994-4972 or email bobbranco93@gmail.com. Follow this link to sign up for Consumer Vision Magazine’s mailing list. You may also send your contribution to Consumer Vision via PayPal if you choose. Just use the PayPal button below to make a contribution with a credit or debit card. A Paypal account is not required. Robert Branco is the columnist of Op Ed with Bob Branco for Matilda Ziegler Magazine for the Blind website. Follow this link to read Bob’s contributions. MatildaZiegler.com is a well-rounded blend of general interest news and blindness-related information specifically for the blind and visually impaired.